At BPS, we have an in-house team of Commercial Gas Engineers in South Wales that are all completely accredited in gas work and safety. We are Gas Safe Registered and make certain any gas work is compliant with existing regulations. Our gas engineers are experts in the installation of commercial gas pipework in addition to the commissioning, repair, and maintenance of gas pipework. The team will decommission any services and appliances, including heating and cooling system and boilers if existing equipment may need to be replaced. In the event that you have a fault or have concerns with any of your gas equipment or service then our team are available 365 days a year in order to make sure any faults are rectified promptly and safely. We will get an engineer to you quickly as understand the value of fast fault identification and resolution. In addition to offering 24/7 reactive gas services, we also supply a fully planned routine maintenance service that will always keep your gas appliances and works operating effectively and safely. A routine maintenance visit will prevent problems with your systems well before they become a problem so is often something our team encourage you to take into consideration. Our Gas Engineers qualifications and experience make it possible for us to fix all forms of plumbing, heating, boiler or gas related problems. Whether it is a routine boiler inspection or a gas pipe issue, our company can assist. We aim to be with you within 4 hours and can ascertain and correct gas, plumbing and electrical faults on all gas appliances. Our team of Commercial Gas Engineers deliver unequalled heating solutions, across South Wales, 24 hours a day. Our company offer coverage across South Wales for commercial gas works via our network of BPS commercial gas engineers. Give us a call today on 029 20 484114. The purpose of a Gas engineer and installer is fitting, testing and repairing gas appliances and pipework within the home. A commercial gas engineer and an installer will service, repair and install commercial appliances, heaters, central heating boilers and pipework in academic institutions, colleges, churches, civic establishments etc. and businesses. At BPS, we have an internal workforce of commercial gas engineers that are all fully approved in gas work and safety. Our Experts are Gas Safe Registered and ensure that any gas work is compliant with existing regulations. Our gas engineers are authorities in the installation of commercial gas pipework in addition to the commissioning, repair work, and routine maintenance of gas pipework. The team will decommission any services and appliances, including things like heating systems and boilers existing equipment may need to be upgraded. If you have a fault or have concerns with any of your gas equipment or service then our team are genuinely readily available 365 days a year to make certain any faults are corrected swiftly and safely and understand the importance of fast fault detection and resolution. As well as offering AROUND-THE-CLOCK reactive gas professional services our experts additionally provide a fully planned maintenance service which will help keep your gas appliances and works performing proficiently and safely. A routine maintenance visit will protect against issues with your systems before they come to be a problem and so is always something we encourage you to contemplate. Our Commercial Gas Engineers South Wales qualifications, as well as experience, makes it possible for us to repair almost all types of plumbing, heating, boiler or gas related issues. No matter if it is a standard boiler check-up or a gas pipe problem, our staff are able to assist. Our customer-focused company ethos means that each and every employee at BPS is focused on delivering the very best service every single time. Our team only do a job if it really needs doing and also complete all work to the highest possible standards. All our Gas Engineers are customer facing and have exceptional communication skills, with the capability to describe to our clients the work that is needed and keep them updated on the progression of their job. 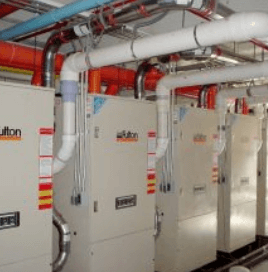 Our experts have wide-ranging experience and expertise in the instalment and repair and maintenance of commercial boilers and heating and cooling system ranging from smaller sized boilers right up to full plant room installations. We install and operate commercial boiler control systems and these enable us to pinpoint problems with your heating long before you do. Through an online network, we can monitor distinct faults on your heating and cooling system, diagnose them and sometimes correct them remotely. Whenever our Commercial Gas Engineers South Wales aren’t able to remedy it remotely then we will definitely have pinpointed the problem before we arrive, granting us more of an opportunity to deal with it on our very first visit. In the event that you are installing a brand new system or appliance then we offer a consultancy service to advise you on the industry’s most current energy-efficient and cost-saving products. This professional service includes the planning and design phase, right through to installation and project completion, in addition to planned aftercare. Why would you work with a commercial gas Engineer? A Commercial Gas Engineer will certainly be experienced in working with, repairing, maintaining and installing larger sized gas appliances, heating systems and pipework and this means they will possess the knowledge needed to maintain and repair these kinds of larger systems. A registered and accredited Gas Engineer will have an industry qualification, for example, Gas Installation and maintenance or Gas Utilisation Engineer Level 3 NVQ or Diploma and be Gas Safe registered. Some qualified gas engineers become qualified from working through an apprenticeship and still achieve the exact same qualifications as the end of it. Why is it important to choose qualified Commercial Gas Engineers South Wales? It really is simple, dangerous and incorrect gas work can be harmful. Badly fitted and badly serviced appliances may cause gas leaks, fires, explosions and carbon monoxide gas poisoning. Using an unqualified illegal gas fitter will place lives at risk in addition to costing you a lot to have it addressed or remedied. It is shocking that there more than a quarter of a million illegal gas jobs conducted each year. In the event that your gas engineer is not Gas Safe registered then they are simply operating illegally. If your gas engineer is certified and registered to undertake gas work in your home then they will definitely be in a position to present you their Gas Safe ID card. Understand that not all gas engineers are certified to work on all types of gas appliances. The back of their ID card divulges you if they are really certified to work on the specific form of gas work you require. As an example, if they put in a gas fire yet they are really only Gas Safe registered for pipework and boilers then they and their work are literally illegal. An additional factor to take note of is if a Gas Engineer works for a Gas Safe registered corporation throughout the week and they are performing work for you outside of this as a private job then this is also illegal. It is actually against the law for any individual to do work on gas equipment in the UK, Isle of Man orGuernsey unless they are Gas Safe registered. A Commercial Gas Engineer will repair, service, maintain and install gas pipework, gas boilers and heating systems. These professionals will certainly have the knowledge and experience to promptly identify and repair issues or pre-empt possible problems that may arise with larger commercial systems. Why are BPS Commercial Gas Engineers South Wales different from Domestic Gas Engineers? A Commercial Gas Engineer will possess the knowledge and also the experience of working with, repairing, maintaining and installing larger and much more intricate pipework with commercial appliances and within commercial buildings. A Domestic Gas Engineer will only have the knowledge of repairing, maintaining and installing gas appliances that are constructed to use in domestic properties as well as gas pipework up to 35mm in diameter within residential homes. There might be instances in more substantial domestic properties where non-domestic apparatus and larger pipework is called for and in these kinds of scenarios, commercial casework categories may be necessary. If you are not sure if you need a commercial or domestic gas engineer then you can call the Gas Safe Register or get in touch with us to get guidance. What hours do Commercial Gas Engineers South Wales work? Most Commercial Gas Engineers will be available 24/7as they will manage both planned maintenance and servicing work, installations along with emergency call-out reactive services also and because of this, it is normal that they hold a full driving licence. The Gas Safe Register is the official gas registration body for the UnitedKingdom, Isle of Man and Guernsey, appointed by the relevant Health and Safety Authority for each area. By law, all gas engineers must be on the Gas Safe Register, and the Register’s role is to act as a licensing body. When a company becomes Gas Safe registered they are being issued a licence to carry out gas work (much as the DVLA issues driving licences to those who have proven their competence by passing a driving test). Consequently, the checks Gas Safe Register make before allowing enrollment only extend to making certain that those applying for, and possessing, registration is appropriately qualified as gas safety proficient. The Gas Safe Register is not a membership body for engineers, nor a trade association. Gas Safe Register took the place of CORGI as the gas registration body in Great Britain and Isle of Man on 1 April 2009 and in Northern Ireland and Guernsey on 1 April 2010. If you need gas work carried out in your commercial property or place of work, you can use the wide range of search options to find a registered business or check an engineer is registered and qualified for the task you need doing. The Gas Safe Register is the official list of companies that are lawfully enabled to implement gas work. Every registered business who employs gas engineers is issued with Gas Safe ID cards. Not all engineers are qualified to carry out all types of gas work so always remember to check their ID card before any work is performed work with an expert, reliable and reputable facilities company, such as BPS, who will only ensure the appropriate and correctly qualified as an engineer is dispatched to your commercial property. If you think a person is working on gas unlawfully, you should really report them to the Gas Safe Register who will then investigate. There are more than 120,000 engineers on the Gas Safe Register and the Gas Safe Register inspects the work they’ve carried out on an ad hoc basis so as to monitor their work is still compliant and safe. If you’ve had gas work completed in the last 6 months, you can nominate it for a free gas safety inspection. The Gas Safe Register investigates reports of illegal gas work. The information they compile is turned over to the Health and Safety Executive (HSE), who have the power to prosecute. The Gas Safe Register conducts public awareness campaigns to make as consumers aware of the risks of perilous and illegal gas work, and of various other dangers, for instance, carbon monoxide gas (CO) poisoning. It is the coordinating body for the once a year industry-wide Gas Safety Week campaign. You should be given a Building Regulations Compliance Certificate if a Gas Safe registered engineer installs a heat generating gas appliance in your property. It’s effectively a way of notifying the Local Authority of the new apparatus, and you should receive it in the post within 28 days of a new appliance being put in. If you need a duplicate Building Regulations Compliance Certificate you can do this online or get in touch with them on 0800 408 5500 and chose option 6. There is a charge for duplicate certificates. The documentation an engineer leaves after having installed, serviced or safety checked a system depends on the purpose and type of work performed. The only paperwork required by legislation is a Landlord Gas Safety Record. It will detail exactly what checks the engineer has carried out and if the appliances checked as to satisfy the appropriate safety standards. BPS is a family owned facilities company based in Wales who have been in operation for many years. We provide mechanical and electrical engineering services, maintaining central heating, electrical, air conditioning, catering and refrigeration systems and our staff of over one hundred qualified, BPS uniformed and DBS vetted engineers are situated at our engineering hubs around Wales. Our service is second to none and we supply a remarkable value for money solutions to commercial businesses and properties around South Wales. Our control and call handling centre are ready to answer your call 365 days a year, 24-hours a day and will ensure one of our suitable Commercial Gas Engineers in South Wales is dispatched to you the moment you need it. You can be assured that we do not use sub-contractors and we do not subcontract any of our work. Our Commercial Gas Engineers South Wales are police checked (DBS), trained and qualified. Carrying industry-specific accreditations (Gas Safe, NICEIC, Chas and B&ES;) and we have ₤10m of public and third-party liability insurance. Our technical support centre is always on hand to answer any type of questions our team out on a job may have and this supports us to resolve and repair systems and equipment promptly and safely. We offer bespoke and specific planned maintenance packages for commercial building operators. This includes inspection, servicing, maintenance and repair and certification contracts with access to our highly reactive emergency Commercial Gas Engineers South Wales support teams. Our care packages ensure that your systems and apparatus are fully serviced and certified providing you peace of mind together with a smooth and hassle-free, dependable operation. Our team of Commercial Gas Engineers South Wales have all the skills needed to make sure your project runs smoothly, efficiently and on schedule without anyone having to deal with multiple parties subcontractors. If you are trying to find a Commercial Gas Engineer South Wales for any repair, routine maintenance or perhaps installation anywhere in and surrounding South Wales as well as a provider that can supply you a genuine and quality service, then please give our expert team a call on 029 20 484114 and they will certainly be happy to help with any type of query or repair you have.